August 5, 2011 – Journey to my heart…. 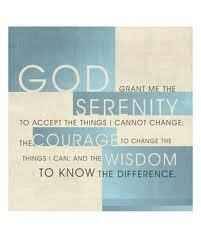 I have been thinking about the words to the Serenity Prayer today. A prayer for peace or tranquility or calm….I think I need to remember this prayer more often. God, grant me the Serenity (peace) to accept the things I can not change….every day I encounter things I can not change. There are small things in my day-to-day and there are big things that affect, our city, state and country. There is so much that I think should be different. I like the idea of being at peace about things I cannot change…. And the Wisdom to know the difference….To know when to stand up and speak and when to know that the battle is not mine to take on….. This is only the most well-known part of the Serenity Prayer….but I think it gives me plenty to reflect on. May I live out the words of the prayers I bring before God! Hoping for a serene weekend for you all! Author trishborgdorffPosted on August 5, 2011 Categories UncategorizedLeave a comment on Serenity Prayer….